These batteries are lighter and more compact than those they were bought to replace. If they last as long as their predecessors I.e.16 years I will be more than happy. 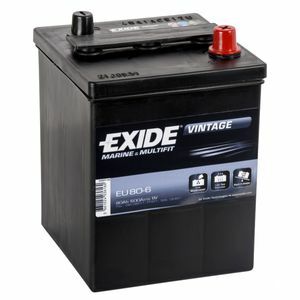 Exide is a renowned brand and the price was competitive. Only niggle was that delivery took a day longer than expected, but I suppose that is down to the courier (DHL) rather than Tayna. A top quality battery at a very competitive price. It was extremely well packed and the cell plugs were secure so consequently there was no acid leakage. I would definitely recommend Tayna Batteries. Excellent speedy service. Battery very well packed for delivery and arrived very quickly. Great price, excellent service and fast, well packaged delivery. A very efficient company thank you. An excellent battery for a vintage car. Superbly packaged and delivered. Very prompt delivery by carrier and excellently packaged. Very pleased. Excellent. This was purchased to replace the useless Shield 6v battery. See above. Fitted to 1932 Austin 7. Powerful battery. Very fast delivery, and extremely well packaged. Can't fault tayna. Good battery too. Excellent battery for my Austin 7. I will buy from you again in the future.